The goal is to use the little bits of what you see from the finished adjacent tiles as a starting point for your tile. I then will put a masked version of the tile into the field (as shown in the image below). Only green tiles can be claimed. Always write the number as the first thing in your post. First come, first served. You can only claim one tile at a time. A tile being green does not mean it has not already been claimed. Please always check the posts of the people before you. Red tiles have been claimed and are being worked on, but always check if stuff is claimed and the image is just not updated yet. Once updated, the tile will show a 72 hour countdown clock from the time of the claim post. You must complete the tile before it expires. Failure to do so leads to freeing of said tile. Complaining won't get it back. Tough cookie. You can not claim a tile which is adjacent to one you made earlier. Finished tiles are PMed to me, Indigo, NOT posted! DO NOT post your tile anywhere until after the activity is over. The point is that no one sees it until all tiles are done. There is no set perspective. 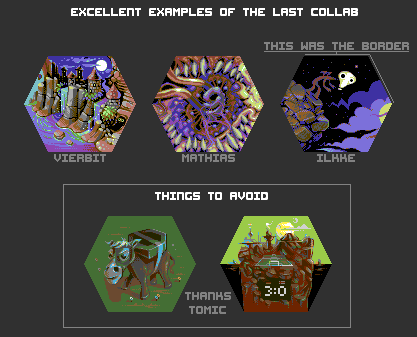 As long as you line your work up with the adjacent tiles all is well. Go wild. While you dont have to use all 32 colors, use as many as you can and polish your piece as much as possible. This palette is a good opportunity for you to polish up your AA and dithering skills. DO NOT use any other colors, including the 4 grey colors of the blank tiles. No transparency (except outside the hex tile itself). Please try and give your best, don't enter sloppy, halfassed work. Awesome! Thanks for doing this! Can't wait to see what crazy shapes these tiles will morph into..
For clarifications sake, the topic is "Corpse"? Edit: Nevermind, it's just part of the name. There are no ugly colours, only ugly combinations of colours. Well you tried your best. I can't copy the image without right click > inspect element. Is that intentional?